I know, I know, this post is LATE (like really, really, REALLY late)! I should have been packed a few days ago, but life happens (and I have been procrastinating it). Here we are, the day I am heading up to meet the #TeamSparkle gals and I am STILL working on the packing process. 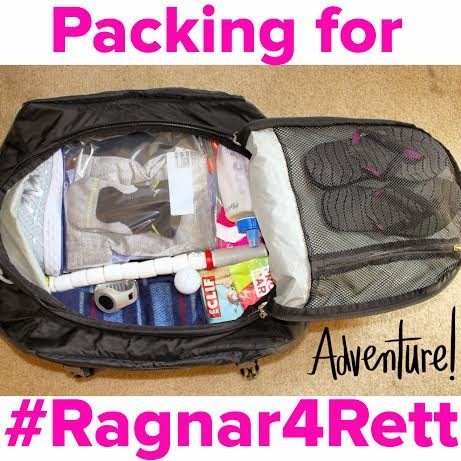 I thought it might be helpful to do a brief post of things I am packing (not only for folks who might be doing a Ragnar Relay Race in the future, but also for me to see what I might be missing...). **Megan keyed me into this for the Dopey Challenge and it worked like a charm so I went back to it. Not only am I able to make sure I have everything I need for each of my SIX legs, I also will have a place to contain the sweaty stench after I take off the gear. **I only have 4 Handful bras, so the other 2 legs will be standard C9 Champion bras from Target. **Sparkle Athletic is providing us with the Sparkle Skirt we will be wearing during the race, but these skirts do not come with anything underneath (which I prefer, because then everyone can find exactly what works for them) so I needed 6 pairs of shorts to wear with the skirt. **Pro Compression was kind enough to provide us each with a pair of purple marathon socks (they were shipped to our "home base" in Orange, so we will get them when we meet up with the rest of the team). I'm not sure how many of the legs I will run in those socks (possibly all of them or maybe just my long legs), so I am packing a pair of Low Trainers (I have 2 grey pairs and 3 black pairs) or PC Runners (obviously I have the banging neon colors) for each leg just in case. **Again, Sparkle Athletic will be providing us with a couple "personalized" tanks for the race, but unless I wanted to run in the same tank for 6 legs, I decided I would throw in a couple extras. The sweet Kathy (with Run With Perseverance) was able to send me some plain black tanks (two burnout and two solid) so they still match the outfit but I will be able to swap them out for a clean one every leg. **Three of my legs will be during the "dark" hours (one at approx 8:30pm, one at approx 12:00am, and one at approx 3:45am). Since I am not sure about the weather, I also am throwing in a couple pairs of capris to wear under my skirt in case there is a chill in the air, as well as a light jacket (I know, you all are probably laughing out loud at my gloves for 50* weather, but I'd rather be safe than sorry!). With only 6 of us running, we will most likely not have too much down time, but I still threw in a couple "clean" shirts to wear when I'm not running (and if there was ANY doubt, obviously they are Pavement Runner tees!). I also will have a pair of Pro Compression sleeves and socks to use during my "recovery" time (what little we may have). Another suggestion I received was a towel to sit on in the car (as to not cover the seats in sweat) and to use while changing outfits. Thankfully Ryan had a brand new microfiber travel towel from Eagle Creek that will work PERFECTLY for this (it even has its own carrying bag!)! Sparkle Athletic is actually providing a sweatshirt, sweatpants and trucker hat for us all to sport or else I would probably be packing something similar myself. **Sparkle Athletic is really providing a ton of this stuff (Aren't we amazingly lucky?! The answer is YES! ), but I still wanted to make sure I had a couple of my own things. Although we will be getting a visor, you know me and my brightly colored sunnies ;) Deodorant because DUH (along with wipes for "on the go showers" and a toothbrush because no one will want to talk to me without one). Aquaphor is a must in my race gear (I use it to prevent chaffing on my legs). Icy Hot for sore muscles. Band-aids in case any blisters pop up. Hair ties because one can never have too many hair accessories. Sunscreen (I will be bringing my face stick, but we will also have tons of sprays and lotions) and chap stick to keep us protected from that SoCal sun. My Garmin - I mean this is obvious, right?! Not only do I "need" to record my mileage and times, but it will be helpful to watch my distance to make sure I didn't miss a turn on the course. And last but certainly not least, a Road ID because one can NEVER be too careful! **Normally I would say NEVER try anything new on race day (but honestly I do this more often than I should, so I probably shouldn't be hypocritical), but when New Balance wants to send your team shoes for the race YOU TAKE THEM UP ON IT! 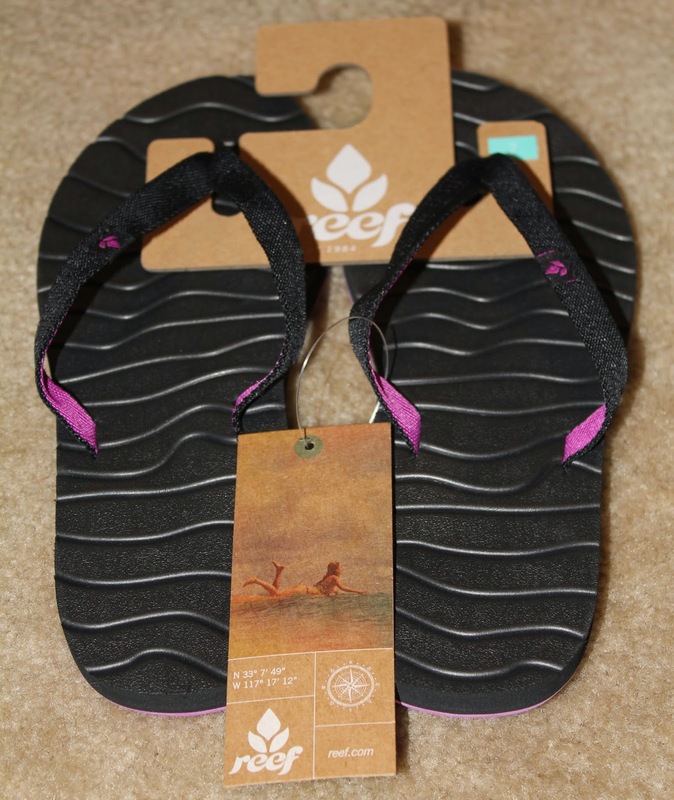 I did "test" them on a couple runs (three 5-milers to be exact), so I guess they aren't technically brand new ;) Also, Reef was kind enough to outfit our feet with sandals for the times when we aren't running! **Sparkle Athletic is totally taking care of us on this aspect (they even asked us for our "orders" on what they should stock in the vans for pre- and post-run food!). Although I don't need to bring a ton myself I did want to make sure I brought fuels and a few bars my body is used to and I know will "work" for me. I will be bringing 3 PROBAR Bolt packages (even though I have 6 legs, a few of them are shorter and I don't think I will need to fuel while running those) and 3 Clif Bars (Chunky Peanut Butter please). As I have mentioned multiple times, Sparkle Athletic is spoiling the crap out of us! I am sure I would be packing so much more if they weren't providing so many amazing goodies for our team! Now that I am packed the nerves are setting in even more (you would think I would feel calmer knowing that this HUGE task is complete) - but maybe it feels REALLY REAL now! Do you think there is anything missing from my packing list? Well, since I've never done a Ragnar I can't say if anything is missing, but it looks pretty good to me! I will say Ragnar is on my bucket list and I'm saving this post for when I (eventually) get to do one! Good luck, can't wait to read all about it! I think you're good. LOL. Maybe other food options though? I know I got tired of clif bars/pro bars really quickly. MRE's (or camping meals) are useful for at least one really substantial meal. Or at least just a handful of other snacks. Gives yourself variety. I know I loved peanut butter pretzels and gummy bears too. LOL. Trash bag. For a) when sweaty gross stuff doesn't fit back IN the ziplock bags. That's all I can see you've missed! Y'all got an AWESOME hook-up with all those sponsers! Way to go! Will you be bringing any encouraging notes of supprt from home? We are all rooting for you!